Christmas is eight days away. Most holiday guests will arrive on Christmas Eve, and if that’s the case for your guests, you have seven days to prepare for the onslaught. Really, you have six days, because you’re probably going to spend that last day cleaning. Okay, five days–you’ll need another day devoted to holiday baking. Oh snap–you know you’re going to have to do some last minute gift shopping, so now you’re down to four days. Discount the 40+ hours you either have to go to the office or contend with the kiddos between now and then and you’re left with two days to prepare for guests. Oh. You want to sleep, too? You’re killing me here. If this scenario describes you at all and you need some last minute decorating tips, have I got a list for you. I know you’ve been hemorrhaging money the past few weeks and don’t want to set foot in a retail store just to buy pillows and candles, so I’ll even make this a list of FREE things you can do–last minute–to prepare for holiday guests. 1. The first thing on the list is already spoken for. CLEANING. 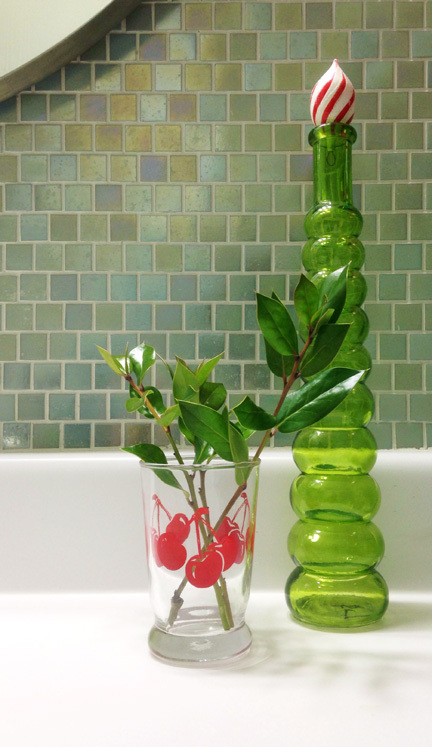 Even if your home decor is lacking in pizzazz and nothing looks cohesive or coordinated, if it’s clean, who cares? Your family and friends are there to celebrate the holidays and making those memories matters way more than whether or not your throw pillows perfectly accentuate the sofa. If your people are the judge-y type, I have two words for you: booze and barbiturates. 2. EDIT. Every year on December 31st, there’s a line of people down at the Goodwill donations drop-off drive thru lane that stretches out the parking lot. Are we suddenly feeling more generous after opening all of our gifts? No. We’re in the line because we’re scrambling for the last minute tax deduction. If, however, you get a jump on that effort by purging your home of unwanted and unnecessary items and hauling them to the thrift store charity of your choice this weekend, your home will feel more open and spacious and you’ll feel lighter and liberated. 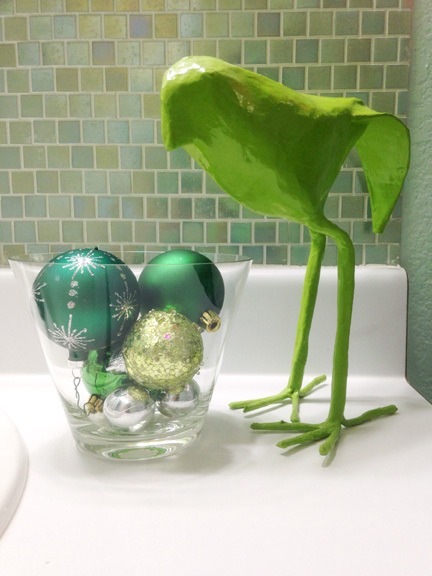 Or how ’bout an ornament sitting on top of a green bud vase? BOO-YA! 4. FREE MISTLETOE. Now that all of the leaves have dropped, you might have seen little ball-shaped clumps of foliage on otherwise bare branches of trees while driving around town. Did you know that’s mistletoe? It’s actually a parasite on the tree. We are compelled to kiss underneath a parasite! 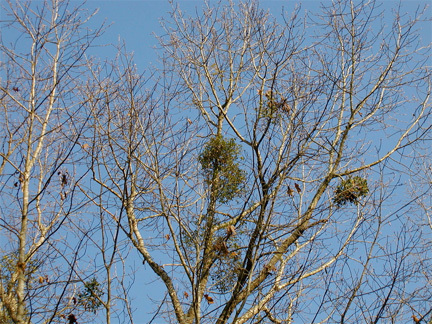 Find a neighbor with mistletoe clumps and ask if you can rid them of a little parasite. Tie it up with ribbon, hang it from a doorway, and voila. 5. TRIM the BUSHES. 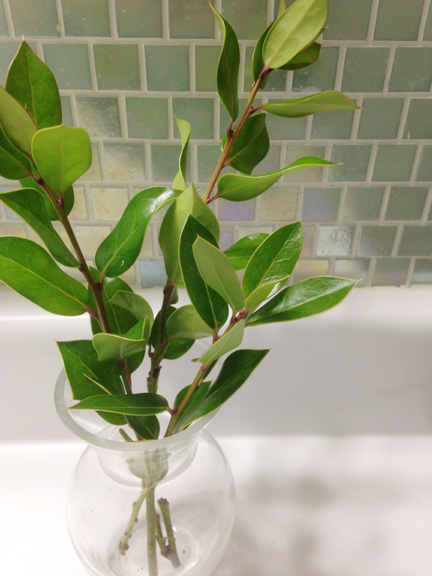 Holly being a relatively inexpensive and hardy plant, chances are good you have some growing somewhere in your yard. 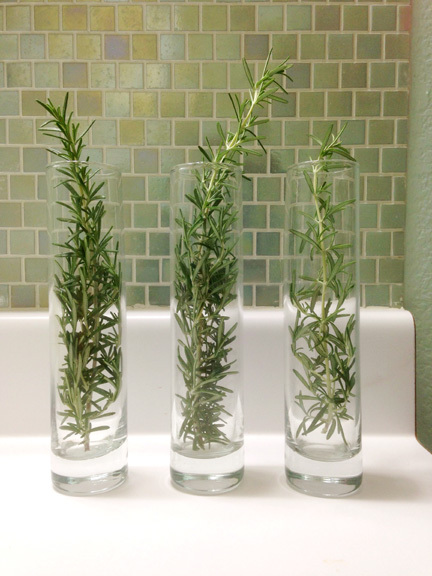 Clip off a few stems, trim off the leaves at the bottom of the stems, and pop them in a vase. 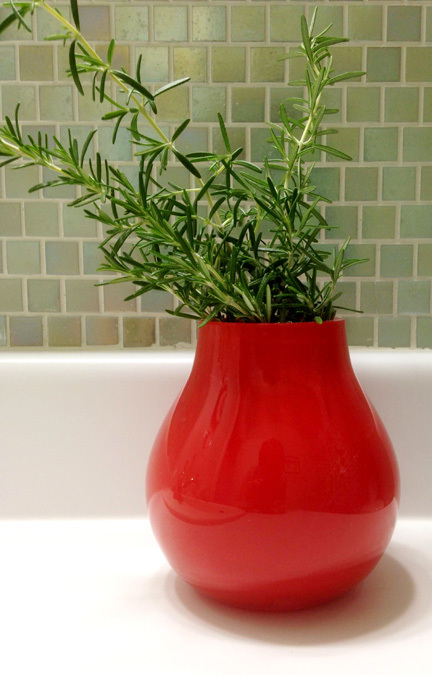 Now you have yourself a free holiday “flower” arrangement. Bonus if you find sprigs with little red berries still intact (although these are poisonous, so I don’t recommend this if you have curious pets or small kiddos). Not feeling confident of your floral arrangement skills? 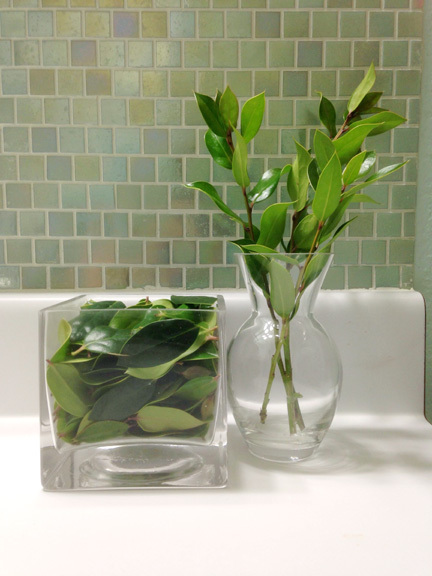 Holly leaves in a small glass vase are a chic, no-miss holiday decoration. Check out a similar decorating idea we used last Christmas during Natasha’s mini-makeover. 6. SET the TABLE. 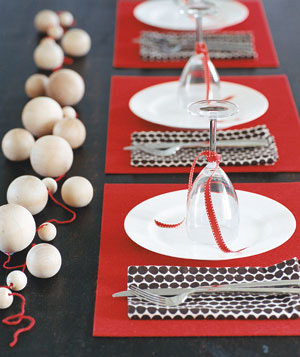 Your formal dining table never looks prettier and more festive than when it’s set for dinner. Get a jump on Christmas Day duties and make your dining room look spectacular by setting the table before your guests arrive. Photo by Lucas Allen, via Real Simple. 7. PAMPER YOUR PEOPLE. 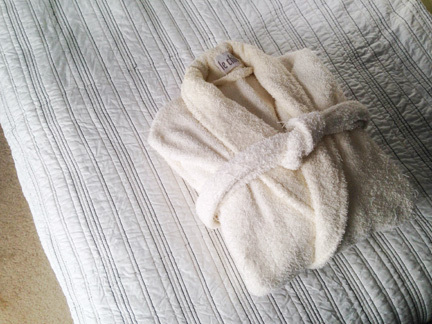 Give your guests the hotel treatment by hanging your bathrobe(s) in the guest bedroom closet, or if you’re the Martha Stewart Everything is Perfect type, you can fold it up like the hotel maids do and leave it on the bed. If you have an en suite master bathroom, you won’t need it anyway–and if you don’t have an en suite bathroom, it’s a small sacrifice for your guests’ comfort. 8. COLORIZE YOUR BOOKS. Yes, I’m trumpeting that horn again. 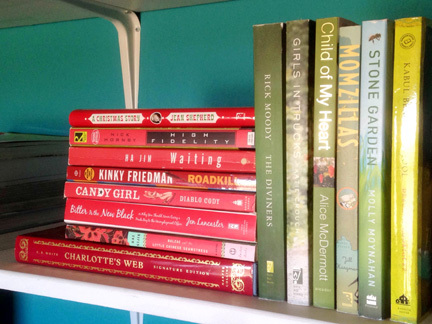 If you’re decorating in traditional colors like red, green, white, gold, and/or silver, collect books with spines in those colors on one shelf for some subliminal holiday magic. Aside from the tablescape photo I nabbed off the interwebs, this was all stuff I threw together in two seconds using things I already had in the house. That’s a lot of Christmas bang for no bucks!